The buds’ fuchsia color complements a Jardiniere pot from Bauer Pottery Com­pany (bauerpottery.com). 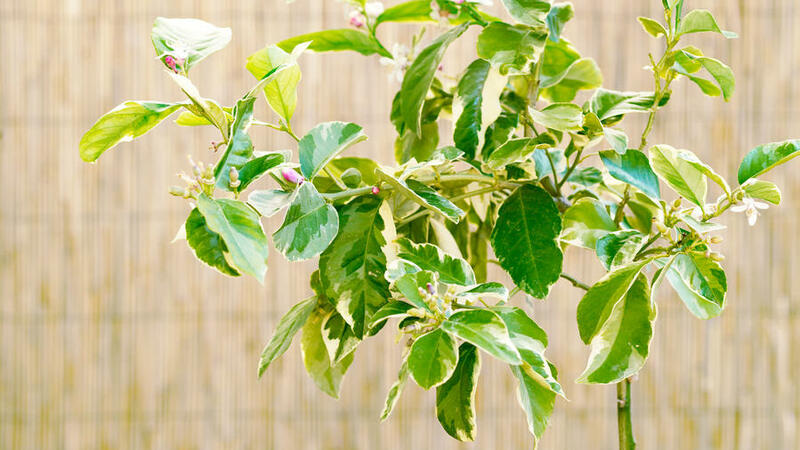 The tree: The variegated pink Eureka lemon is usually sold in a 5-gallon container when it’s 2 to 3 years old. In the ground, it grows 12 to 15 feet tall. Keep it small enough for a pot by pruning the foliage and roots every four to five years. The foliage: Apple green leaves have creamy white to pale yellow edges. Where to grow: Display in a site that gets at least 4 hours of sun a day (8 is better), and is protected from wind and frost. The pale yellow fruit is streaked with green before fully matured. The fruit: Green streaked ​ with gold when young, it matures to pale yellow. Pink flesh produces clear juice. Expect a few lemons early on; more when the plant is four to ​five years old. How to plant: Choose a pot at least 16 inches in diameter. Fill the bottom inch with fast-draining potting mix, set in the rootball, fill around it with more soil, then water. ‘Gold Nugget’ mandarin: Seedless and super-sweet, these easy-to-peel mandarins ripen on the tree from early spring through summer. Australian finger lime: Its jalapeño-shaped fruit can reach ​ 5 inches long. Inside, “beads” filled with tart juice burst when you bite into them. 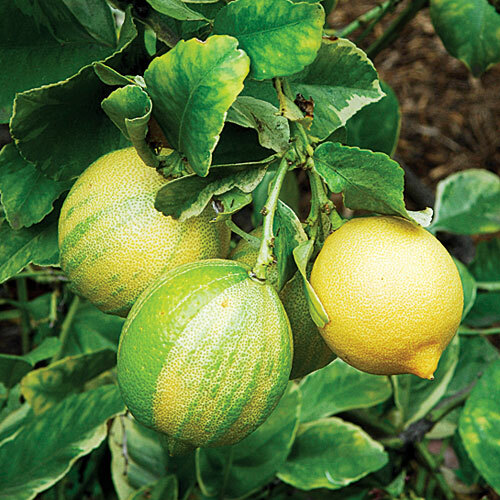 Organic Meyer lemon: The favored sweet-tart fruit is now available on an organically grown tree. It starts bearing fruit early on and can produce all year.